Jun 2018: The Trade Partnership Worldwide recently published a brief on The Estimated Impacts of Tariffs on Steel and Aluminum by Dr. Francois, L.M. Baughman, and D. Anthony. According to the authors' estimates, the tariffs will result in a short-term 0.2% annual reduction in GDP and a net loss of 400,445 jobs across the US economy with more than two-thirds in production and low-skill jobs. Apr 2018: A NY Times article, Federal Budget Deficit to Top $1 Trillion in 2020, was published in reaction to the current CBO Budget and Economic Projections: 2018-2028. The article may include political opinions which do not necessarily reflect the opinions of this office. We encourage readers to review the CBO Projections independently and have provided a link to the CBO Excel Spreadsheet with the projections by year and category. Feb 2018: The latest Economic Report of the President is available at The GPO which provides links to the various chapters for easy to find subjects of interest. The report summarizes the current Administrations policies and visions while providing detailed statistical information in its appendices. Jan 2018: It’s Tax Season and the New Tax Bill has been signed. Click here to find out how the new tax bill will affect you in 2017. Dec 2017: Learn how to sort facts from fictions when dealing with economic policy debates. An economist explains how to do this in an article published in the NY Times. Click here to find out. Nov 2017: Employment increased by 228,000 and the unemployment rate was unchanged at 4.1% in November 2017 according to the BLS Economic News Release published December 8, 2017. Nov 2017: 5 main ways U.S. workforce has changed since the Great Recession of 2007, according to Pew Research Center: 1) Less Americans in the labor force, 2) more diversity, 3) more 55 and older workers, 4) longer unemployment periods, and 5) a slower shift towards service jobs. Oct 2017 ACS: American Community Survey's annual data release provides statistics on a variety of population and housing topics for the nation, states, and your community. Click here to get the latest statistics from the 5-year 2012-2016 American Community Survey for the United States or go to the American Fact Finder for data on specific locations. Oct 2017: BLS Economic Projections for 2016-2026 The U.S. Dept. of Labor regularly forecasts the demand for various occupations. They also give the average wage and the educational requirements to help you determine if the education you are getting is in an area where the occupational demand is high and wages meet your expectations. The latest report was released in Oct 2017. This News Release provides some highlights of the report. Sep 2017: Canada Letter: Health Care Comparisons, published in the NY Times stated that Canada was knocked out early due to long wait times in this head-to-head comparison of health care systems throughout the world; however, "longer wait times in Canada" was not due to the system's design but the lack of funding since Canada spends "about half of what the U.S. does for health care." According to the article, "wait times are most likely an economic decision, not one inherent to single-payer." Click here to read the full article. Sep 2017: Employer Health Benefits 2017 Annual Survey results are in. The annual premium for Employer-sponsored family health coverage is up 3% with annual premiums of $18,764 with workers paying about one-third of the cost according to the study by Kaiser Family Foundation/Health Research and Education Trust. Single coverage came in at $6,690 per year with worker contribution at only 18% of the total premium cost. Click here for the full report. Please note this report may take a few minutes to load. Aug 2017: Will the low unemployment rate cause inflation to spike? Not according to James Bullard, President of the Federal Reserve Bank of St. Louis. According to Mr. Bullard the relationship between unemployment rates and inflation is minimal. Click here to view his analysis on this issue. Dr. Mellish is a specialist in the valuation of loss due to business damages, wrongful termination, personal injury and death. He has been qualified as an expert witness in the majority of the Circuit Courts in Florida and many Federal Courts in various states including FL, GA, AL, NY, TX, CA, US Virgin Islands, and others. This office has a reputation for providing expert witness consultation at the highest standards. We assist attorneys in identifying areas of damages as well as calculating the present value of future losses including lost wages, benefits, the value of household services, the amount necessary to provide medical care in the future, hedonic damages (value of the loss of enjoyment of lifestyle issues) as well as punitive damages in cases that warrant it. In worker’s compensation cases, our reports are often made a part of the fee petition package. We have designed a computer-assisted format for presenting the results of our analysis in the worker’s compensation cases. We have also developed a computer-assisted format for calculating the present value of future medical care items required in a life care plan for catastrophic injury cases. These computer assisted formats allows us to keep billing to a minimum by reducing the amount of professional time needed. Please refer to our Services page for a detailed list of services provided. What does it take to evaluate economic damages? We can usually provide an estimate in a 5 to 15 minute phone call. We do not charge for such brief consultations. By contrast, a written report requires documentation for underlying data. That is what takes the most time – and is billable. Business damages cases are different from personal injury cases when it comes to quick estimates. That said, we can usually describe the type of underlying data that will be needed to estimate business damages in a 5 to 15 minute consultation. What's happening with the unemployment rate? The latest BLS figures on the US employment situation as of April 2018 shows the Unemployment rate at 4.1% with a net decrease in unemployed persons of 121,000 and a net decline in employed persons of 37,000 with a total net reduction of 158,000 persons in the Labor Force. The total net reduction in the Labor Force is equal to the decrease in the employed and unemployed persons, but this is misleading. The Labor Force consists only of the Employed and Unemployed and will always equal the two figures presented for these two categories. A net reduction or increase in the civilian labor force can be age-related, education-related, health-related or economy-related (leading to discouragement). 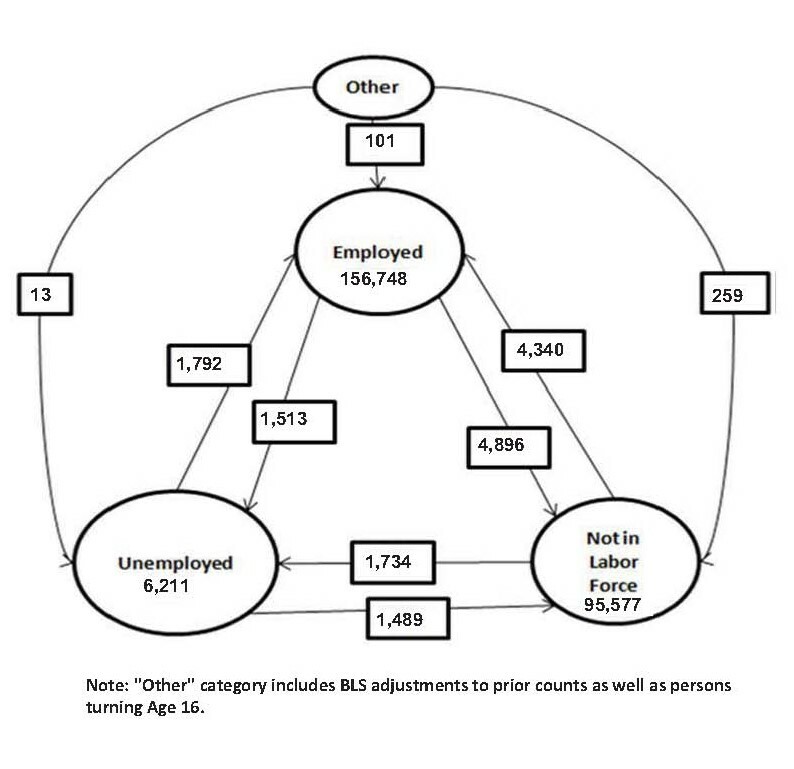 This can cause an increase in job creation to have less of an impact on the overall unemployment rate due to additional people being added to or leaving the labor force for these other reasons such as graduating from school or college, completing a rehabilitation program, being injured, early retirement, or simply reaching an age outside of the countable age for the Survey. The figures presented are the net change in these categories which includes in-flows to and out-flows from all categories. The flows into and out of these categories give a better picture of what is happening in the employment/unemployment situation. 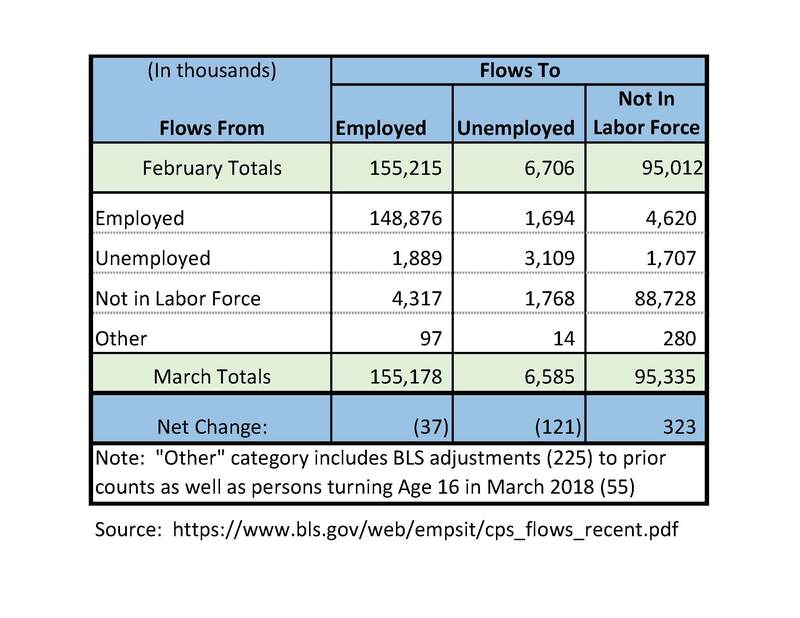 The following Flow Chart shows the BLS reported employment status changes for March 2018 (Flow Chart figures are in thousands). Click on image for corresponding data table. The number of unemployed persons declined by only 121,000; however, it represents 3.5 million new unemployed persons and 3.6 million people leaving unemployed status. According to the BLS data presented in the above diagram, only 1.9 million returned to work; the other 1.7 million left the Labor Force. The 3.5 million new unemployed persons is made up of 1.7 million persons from the employed sector and 1.77 million persons entering or re-entering the Labor Force. To get an accurate picture of the unemployment rate, it would be important to take a closer look at the Not in the Labor Force category. How many persons are in this category due to economic conditions? The unemployment rate reflects the percentage of those people represented in the Labor Force and does not include those who have become discouraged and are no longer seeking employment or who are under-employed due to economic conditions. According to the BLS, these persons represent an additional 3.9% of the Labor Force bringing the unemployment rate up to 8% as of March 2018. In Dec 2016, the Federal Reserve started increasing the Federal interest rate by .25% bringing the rate to .75%. They have continued this upward swing into 2018 with the current rate being 1.75% with additional increases planned for the remainder of 2018. For an interesting look at the Fed Funds Rate history, check out this article by Kimberly Amadeo with The Balance. If you’re wondering what these hikes mean to you, this Reuters article regarding the impact of the rate hikes on U.S. households may be helpful. How does this affect the present value of future economic loses? When the interest rate or discount rate is low, the present value of future economic losses will be higher. However, the other element in the present value calculation is the growth rate in wages, or in future medical expenses. When interest rates are low, these other two elements of the present value calculations will also be low. Therefore, the present value will not be substantially different than in a period of high interest rates. According to the above table, the predictions were good, but it hasn’t been a year yet. According to the March 2018 CNBC report, the Fed is planning to increase the rate three more times this year; two of which will be before the end of the 1-year prediction period. It is already at 1.75 and with two more hikes, it is likely to surpass the predicted rate. Unemployment, as reported by BLS, is already at the level predicted and could possibly stay at that level. The declining jobs created figure is on its way to hit the mark according to the March 2018 CES Report, and could reach the prediction by Q3 2018. The 10-year treasury yield surpassed the predicted rate according to the US Treasury; however, that is a moving target and fluctuates up and down daily, so it could come back down theoretically before the 1-yr period is up; however, it is unlikely given the additional Fed Rate hikes anticipated in 2018. We will have to revisit this next quarter to see how things shape up. If you want to discuss this in greater detail, please give me a call. You can also find interesting links to information such as the current gas prices and what makes up the gas price as well as Tax Facts 2017 and proposed tax policies for 2018 on our Humor & Interest Page.